This is the first time I’ve sketched a ‘save the date’ card. A couple recently got in touch to ask if I could create a sketch for them to send to guests of their upcoming wedding in the capital. 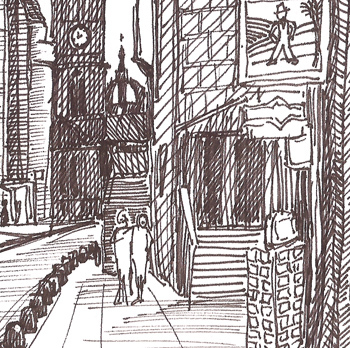 I incorporated a large sign in the foreground of this drawing of the Royal Mile in Edinburgh’s Old Town, so I could include the details of the big day (I’ve blurred out the date). The sketch is drawn in fine liner black pen and then a watercolour wash added for a little colour. We included a couple of hidden messages in the signs on the opposite side of the road, for instance the canon and gate on the right signifies the couples wedding venue, the Canongate Kirk. 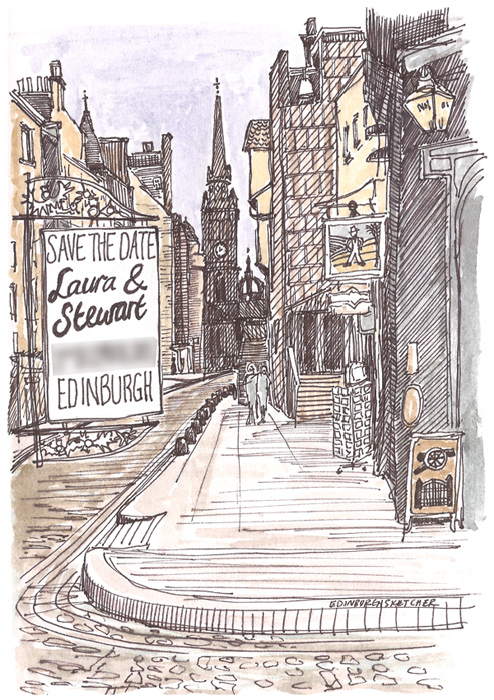 Its a lovely way of sending your guests an original piece of art for them to keep safe until the big day, and show them a glimpse of Edinburgh. If you would like to commission a Save the Date card then please get in touch HERE to discus further. Along with the original sketch I will also provide a digital print ready version via email and on a CD for you to take to your printer. If you wish I can also arrange printing through my own printers here in Edinburgh.